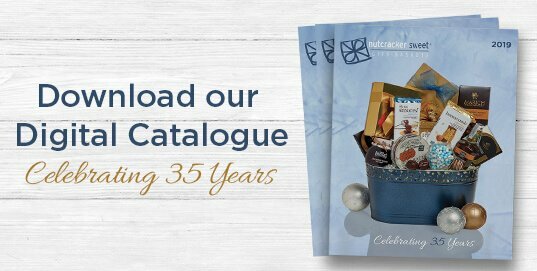 For 35 years, Nutcracker Sweet Gift Baskets Toronto, Canada has been a leader in the gift baskets industry, providing innovative, stylish and contemporary gifts. Originally servicing Corporate Toronto and Canada we now provide Gift Baskets not only across Canada, but to the USA and 30 other countries worldwide. 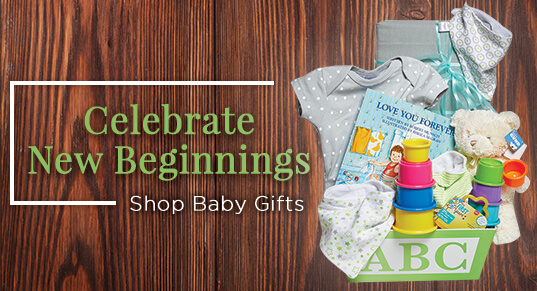 From gourmet and sweet gift basket combinations, to our breathtaking baby gift baskets, our creative design team sets us apart to provide you with a great gift giving experience. Any baby basket can be personalized with a custom baby ribbon for an additional $5. Imagine an experience so professional and a product so tasteful you'll want to keep coming back for more. That is the Nutcracker Sweet Gift Baskets Toronto difference! Our legendary customer service leaves a lasting impression. All Gift Baskets in our catalogue are appropriate for any occasion, or we can custom-design your own personal or corporate gift. We provide many of Canada’s largest corporations with their corporate gift baskets. With personalized service, corporate branding and a delivery program across Canada, ask us how we can help you send your clients gifts that are exceptional and most importantly, remembered. A devoted corporate specialist will work with you through the whole process from conception to delivery to ensure a satisfactory conclusion. Come visit our large state of the art facility and gift basket showroom at 3717 Chesswood Drive, Toronto, Canada or stop by our location in Scotia Plaza - 40 King Street West Concourse Level. We also provide gift basket delivery across Canada and North America, and next day delivery service to Greater Toronto Area locations including Vaughan, North York, Etobicoke, Concord, Ajax, Oshawa, East York, Whitby, Scarborough, Pickering, Markham, Toronto, Mississauga. We also offer weekend deliveries in Toronto and all over Canada. Ask us about our special couriers for orders outside of the GTA. During the holiday season, we extend our delivery service to seven days a week instead of six. Contact Nutcracker Sweet gift baskets Toronto for more information about our weekend deliveries! Who doesn't like gifts! Everyone enjoys a nice basket of goodies sent by a loved one. Gifts on occasions or not, they are always welcome. Christmas, New Year's Eve, Thanksgiving or birthdays, gifts mark the importance of every special celebration. If you want to gift someone special with made-to-order gifts, you won't have to break your head over thinking of gifting ideas. Find the best gift baskets in Toronto at Nutcracker Sweet Gifts Baskets. Our baby gift baskets are famous in Toronto and across Canada. We have customers from around the globe who order these gift baskets in Toronto and Canada for their friends and families. We have expensive, luxury gift baskets as well as basic economical gift baskets for babies. We have got all kinds of budgets covered with our great looking gift baskets of excellent quality baby products. We offer a variety of luxurious gift baskets that are available online for you to look through and purchase. We offer free shipping in Ontario for purchases over $100. You will certainly find a perfect gift basket for your loved ones this holiday season from our diverse array of gift basket designs. Surprise someone special this Christmas and leave them over-joyed with a gorgeous hand-crafted gift basket from Nutcracker Sweets. Make someone’s special day even more special with our beautifully crafted and designed wedding gift basket. In a situation, when you can’t be there for someone you love on their D-day, just pick out and send your love and goodwill with a beautiful Nutcracker wedding gift basket that will add sparkles to the happy couple’s day. Life is full of significant milestones and people love sharing their special days of achievements with family and friends. So, don’t stay behind in congratulating someone you love and appreciate on their retirement with Nutcracker Sweets retirement gift basket. 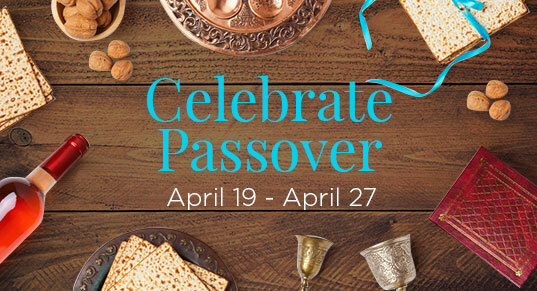 Come and join them in their celebration and offer a caring gesture to a co-worker, employee, subordinate or a friend. With Nutcracker Sweets, you can now send corporate gift baskets in Toronto or any location in Canada to your business partners or vendors. We offer our customers some of the best premium corporate gift baskets. Our corporate gift baskets are finely crafted and created that will impress anyone. For corporate orders, send us an email with Gift Baskets and we will reply to your email with an estimate and corporate discount if applicable. There are occasions we plan in advance for days and then there are some others that are urgent and show up all of a sudden. 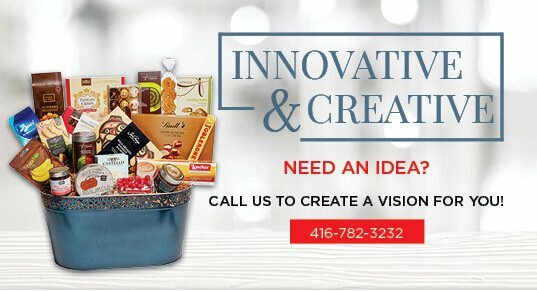 If you are in an unexpected need for a Gift Baskets in Toronto that you'd prefer to have delivered the same day, we will make exceptions and do it for you for you. For our same day delivery in Toronto, place your orders at the start of the day and for over $100. We deliver in Toronto GTA (Toronto, North York, East York, Mississauga, Richmond Hill, Scarborough, Etobicoke, Thornhill, Vaughan, Markham). We don't offer any same day delivery on Saturday and Sunday.